We want a particularly interesting idea for today Decorating the walls imagine. These are original murals whose motifs are made of stones. With a little imagination you can create remarkable works of art for which you do not even have to have a special talent. We would like to help, as we provide you with some suggestions that will allow you beautiful photos with stones can do by yourself. Even beginners will have absolutely no problems with it. 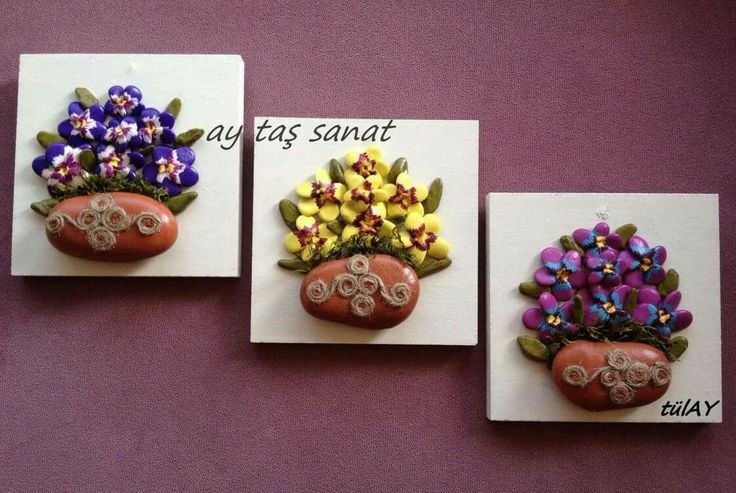 You can create pictures of stones in various ways and with different motifs. 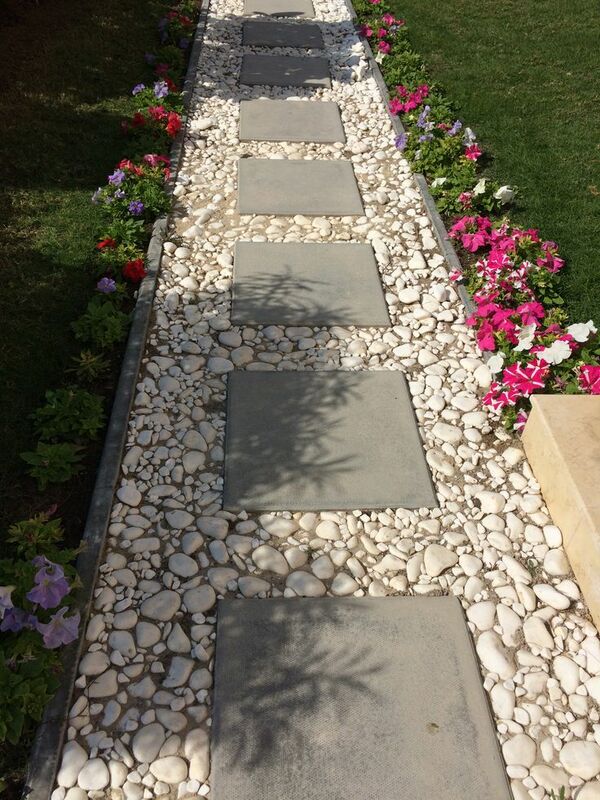 The easiest way is to simply clean the stones and use them in a natural look. You can use the stones but also like a transparent varnish paint before you tinker the images with stones to highlight the stones even better. The stones do not necessarily have to be the only material that can be used for the images with stones. Here you see a great idea where a piece of bark is used as a floor. A pretty seashell again forms the skirt of the dancer. 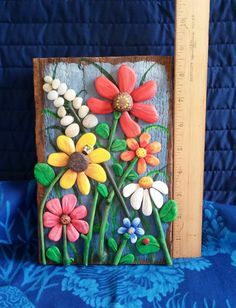 With several natural materials the image appear even more vibrant. The stones can be arranged as desired to certain figures. The sticking of the stones is simply done with a hot glue gun. Make sure you use enough adhesive, but not too much so that the glue does not swell on the sides when pressing on the substrate. About you this best on a different ground, before the images with stones tinker. Pictures with stones that have a specific theme are not only suitable for the decoration of their own house, but are also a perfect gift. 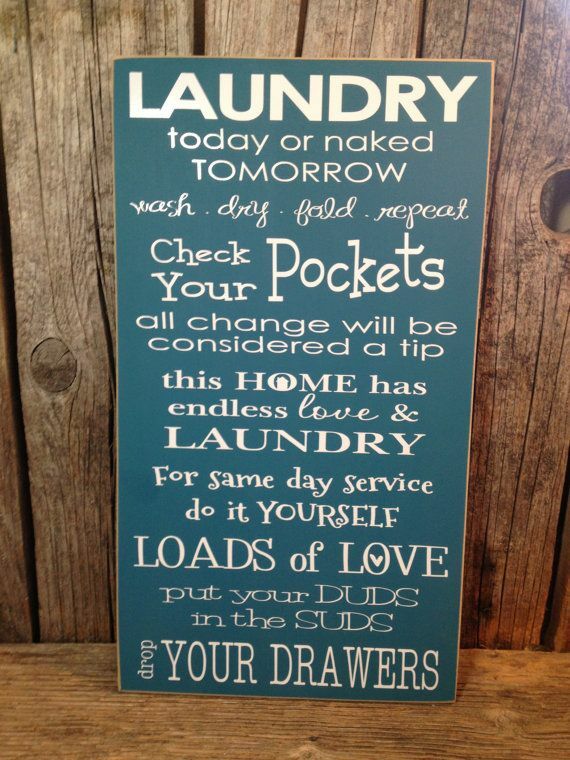 The top example can be designed as a wedding gift. The idea is not only original, but also has a special charm in that it is self-made. It is not too complex and pompous. 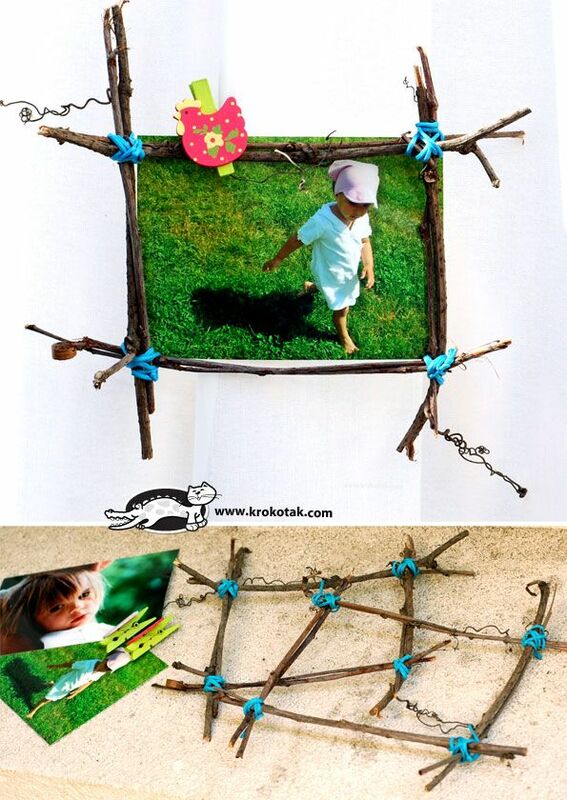 Since you use natural materials for the images with stones, you can choose any style for the frame. Here you can see an attractive frame in a rustic style, but also a modern or vintage frame is suitable to get the perfect variation for your home style. She is a bird couple standing on a branch from a zoo. Depending on the picture, several stones may have to be stacked on top of each other. There is no problem with hot glue. Keep in mind, however, that a lot of stones on a small screen or some other background make it harder. This should be remembered when you attach the finished images with stones to the wall. Protruding stacks of stones draw the picture down. 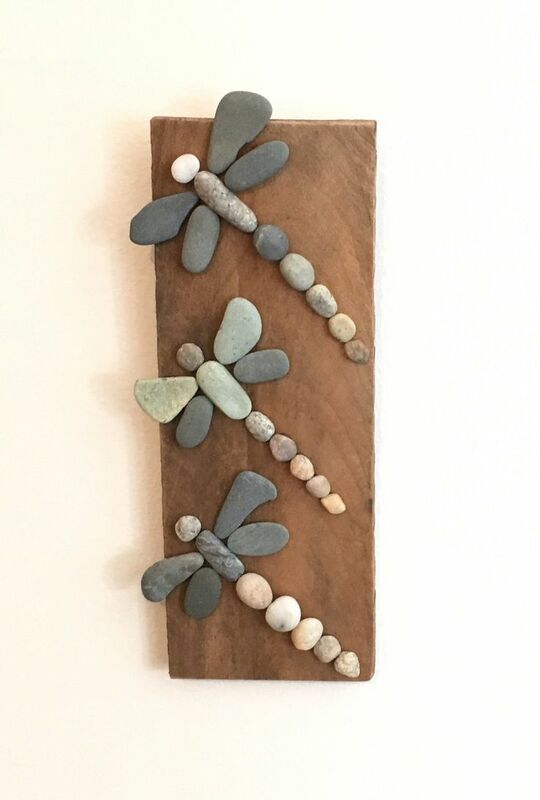 If you are using a canvas, you can paint it in advance and make any background that matches the selected theme for the images with stones. In this example, a turtle can be seen as a motif. As this one lives in the ocean, a dark blue background was chosen. At the same time, the bright pebbles are also better expressed. A classic among the pictures with stones is the tree. With a simple stick and many colorful or even single-colored stones, you can create trunk and crown. The result is simply stunning. With some thin branches, you can also imitate branches. And all this without having to make a brush stroke. If you can not draw, make the right choice with these types of images. 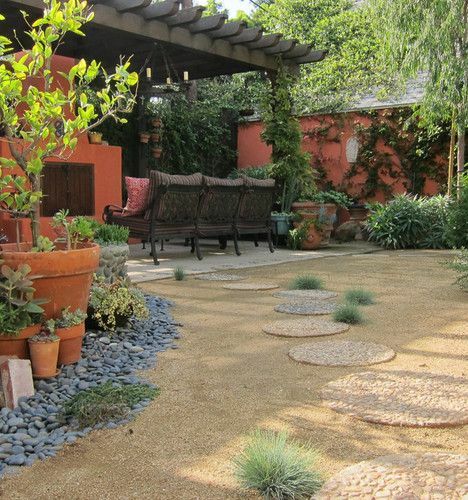 The images with stones do not have to be anything expensive. The above picture exudes a special calm which is not only due to the theme and the motif but also to the use of fewer materials. Suitable stones can be found quickly and easily on every walk. 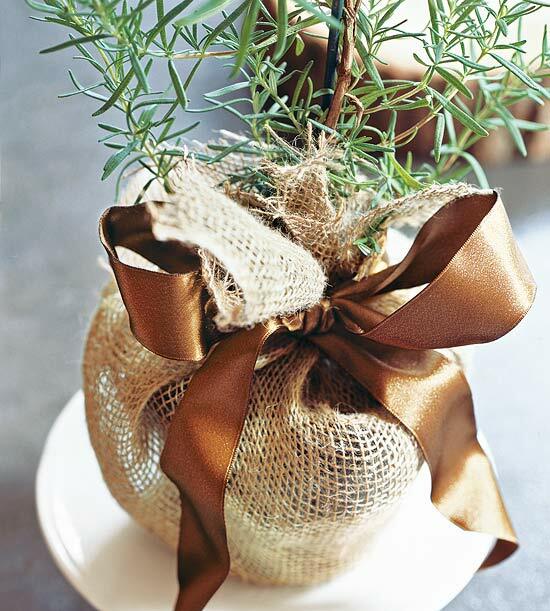 Of course, you can also buy ornamental grains in any natural color. If you want to shape people, you need round stones for the head, oblong for the limbs and oval for the body. Before you fix the stones, place them loosely. Then fix them with the glue. 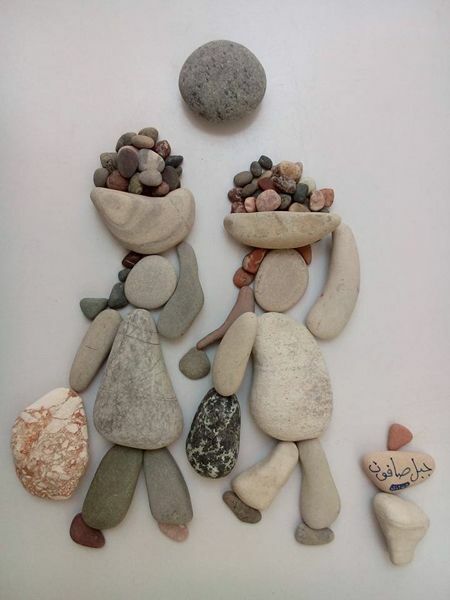 Let your imagination run wild when you design pictures with stones. Often, the shapes of the stones inspire certain motifs. 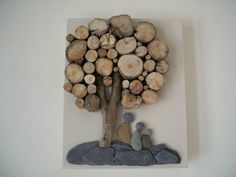 Canvas pictures and stones can be combined perfectly. 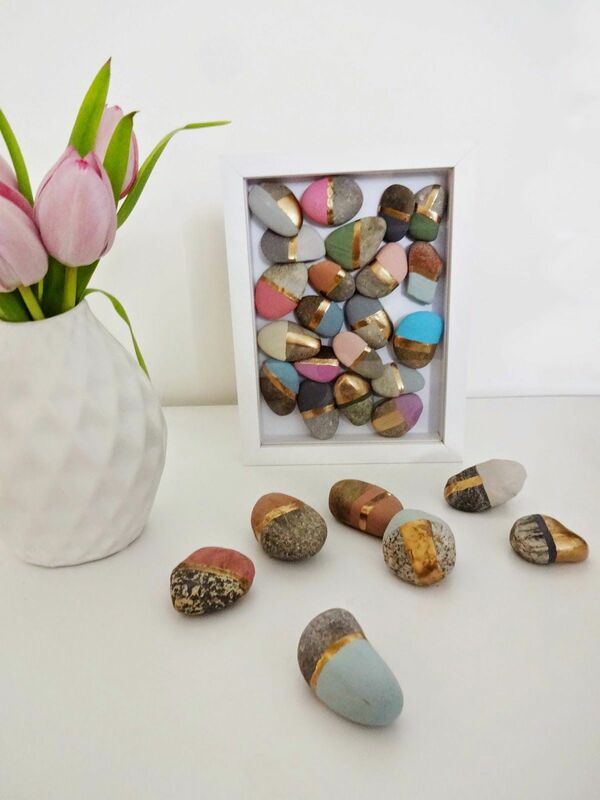 With a little acrylic or even oil paint you can create impressive images with stones that will be a special eye-catcher on the wall. Here a simple background was created again. In this case, these are sky and sea in two different shades of blue. The seagulls again consist of stones. You can symbolize the cohesion of your family with such a picture. A great idea is also lettering. These can be printed in advance on a piece of paper, which you then use as a background for the design of the images with stones. 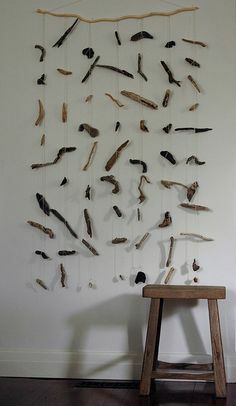 Driftwood is also suitable for stones. This makes the picture look more romantic. On the beaches, on the other hand, it is often possible to find shallow and polished stones. So look for your next holiday. 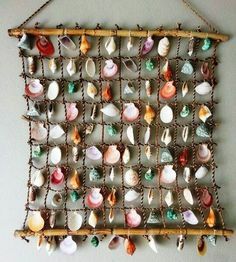 They are particularly easy to craft because they have a large surface for sticking. 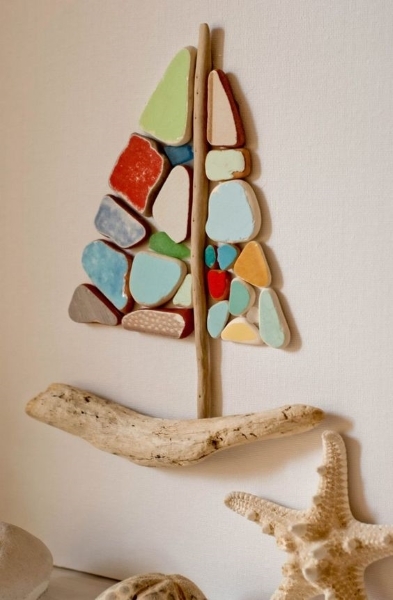 You can also paint the flat stones in color to make colored pictures with stones. Of course not only flat stones can be painted. Above you will see a more elaborate picture, for which stones were redesigned in houses and trees. This way, whole cities or villages and landscapes can be designed. First, paint the background that will allow you to dry. In the meantime you can design the stones. Afterwards, everything is just beautifully adjoined and already the pictures are finished with stones. To keep the color longer, we recommend to seal the stones with a transparent varnish. Look at the way in which the sun was designed. Since you can not arrange stones in this precise way, use the same color as for the background. The rays are so perfect. There are different tricks for the pictures with stones. 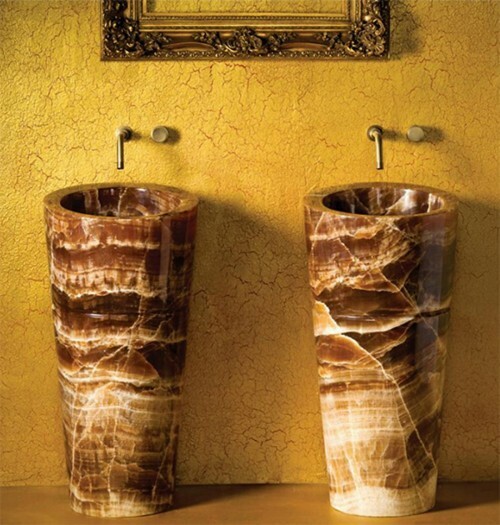 The images with stones have a 3D effect because they protrude. This can be emphasized even more by adding other objects. For this bouquet, for example, decorative fabric was also used, as is done with a real bouquet. 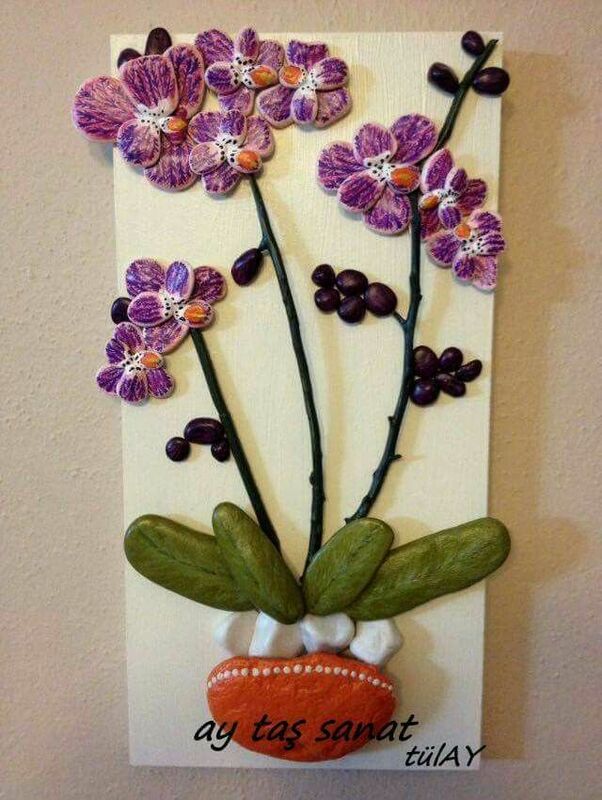 The blooms are made of masonry stones, while leaves can also be made of craft clay. Here you see another example of a city on the coast. Only the sea and the sun were formed. The city even has a church and is surrounded by attractive cliffs. A really great idea for pictures with stones, do not you also? The green stones for trees make the picture even more natural. This peacock looks more complicated than it actually is to make. The interesting thing is that the tail is designed beyond the image and covers a part of the frame. This is also an example of images with stones, in which the stones are stacked on top of each other. This should prevent gaps. To make more complicated is the background. However, you can also choose it differently. This image is particularly humorous. The bride’s motif can also be replaced by another. The picture originally covers the picture frame. 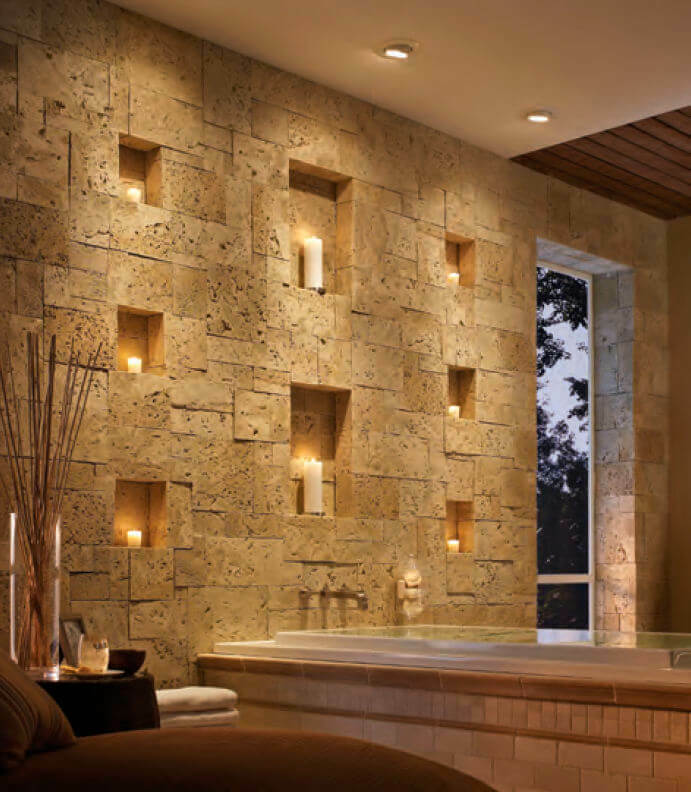 You can create interesting motifs for pictures with stones and thus design the walls in any room. 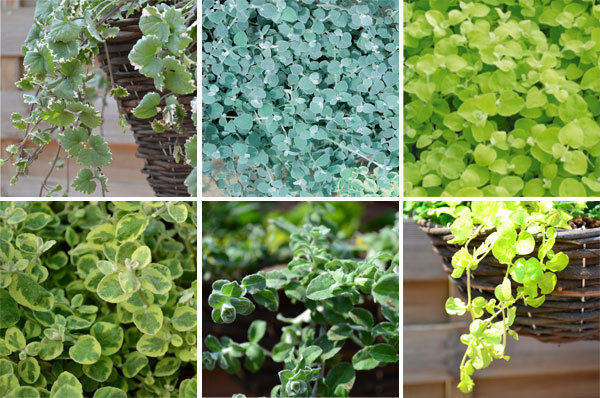 Choose Zen motifs for bath or bedroom, fruit and vegetables for the kitchen and romantic ideas for the living room or make a friend or a relative a joy!